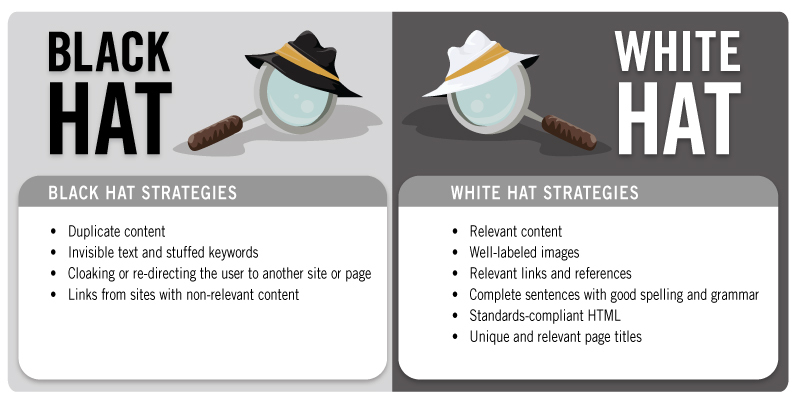 White Hat SEO techniques: How to use the best Search Engine Optimization techniques is a very crucial thing to know. There are the Black Hat SEO techniques or the bad or unethical techniques and also the White Hat or the good and ethical real estate SEO techniques. The difference between the both is in terms of TOS or ‘Terms of Service’ as mentioned by the search engines. Either way will make sure that your page rank on the search engine is increased. However, if you are caught to utilize the black hat techniques, your website will be banned. Hence, it is very important that you know the white hat or the ethical strategies of search engine optimization. When you are working with the SEO strategies that are proper and ethical, you must make sure that you incorporate the keywords properly. The keywords should be relevant. This means that a website that deals with ‘wallpapers’ should not incorporate’ oil paint’ or ‘wall paint’ into the website content. Not only is the relevancy of the keywords, but the position of the keywords is also very important. You must incorporate the keywords in the title, the header or the h1 tag and also make sure that the distribution is proper.Since the web spider will not understand which keyword is relevant to the content and which is not, it is only through the distribution and use of the keyword in the title as well as the h1 tag or header, that will make sure that your website is ranked well on the search engine, after the web spider crawling is done. A website must incorporate good and strong back links to make sure that the content has a strong link support from a relevant link. Sometimes, the black hat SEO techniques and strategies encourage the use of hidden links. These hidden links are incorporated in such a way that the visitor or the audience will not be able to understand the presence of those links and will be redirected to that site automatically. Hence, a white hat SEO user must always use links in clear and bold fonts and not in some invisible or same colour texts as with the rest of the content. Sometimes, unethical SEO experts incorporate fake or doorway pages into the website. This is to manipulate the search engine, by filling the fake page with unnecessary content and 1 or 2 relevant keywords, so that the visitors will land on these pages, but will be redirected to the actual page. This is a very poor and unethical way of manipulating the web spider and should not be used if you are looking for some ethical website optimization strategies. Moreover, the quality of the content that you are using and the authenticity of the content is what matters most. Using software generated content or duplicate content will never make your website go a long way. Hence, it is always useful to know and use the white hat real estate SEO for the website.